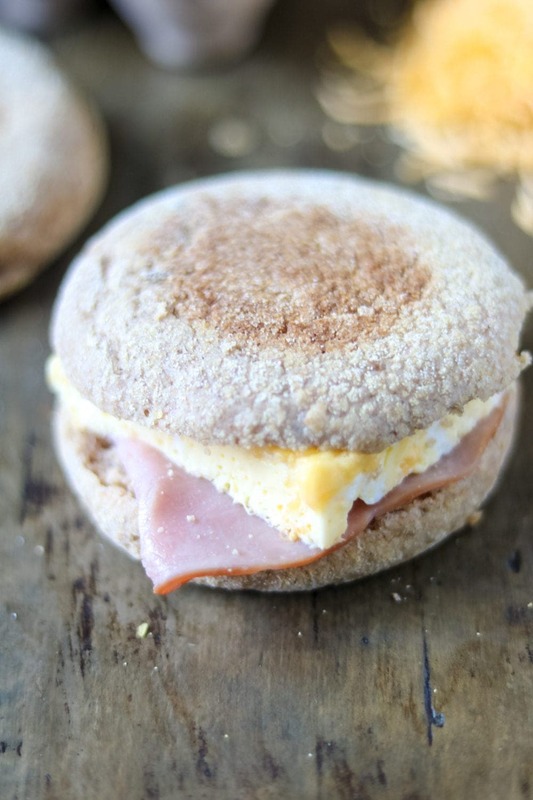 Healthy Homemade Egg McMuffin Sandwiches: Ham and egg breakfast sandwiches come together easily with a sheet pan hack for cooking eggs. Make ahead and freeze for an easy, wholesome on-the-go breakfast and skip the drive-thru permanently. If you asked my kids What is one thing your mom tells you over and over again about healthy eating? They would tell you Eat a healthy breakfast. I have to say I love a portable breakfast. There are mornings (more than I care to admit) that we oversleep and have to grab breakfast and be out the door. And while I can and do give my kids a jar of overnight oats and spoon on our way to school, a hand-held breakfast sandwich that requires nothing more than a napkin to serve it is a fabulous, easy option. It may sound odd to make eggs on a sheet pan, or silicone baking dish as I do, but this kitchen hack will save you time and is almost fail-proof. In the past I have used silicone muffin cups to make Spinach Egg Sandwiches, and while that works fine and well, I am in love with using a silicone baking dish or sheet pan to bake eggs for breakfast sandwiches. No egg mold to clean, no muffin cups to clean, and no making one egg at time! Mix eggs with a splash of milk, shredded cheese, and salt and pepper. Pour into a silicone baking dish or pan lined with parchment paper. Bake unto eggs are set. Turn baked eggs unto cutting board and slice into 6 squares to fit on English Muffins. This recipe for sheet pan eggs can be customized to make as many baked egg squares as needed for breakfast sandwiches. For 18 homemade Egg McMuffins, use a half sheet pan lined with parchment paper work. Allow your baked eggs to cool. Slice eggs into even squares to fit on English Muffins. Toast English Muffins if desired. Place a piece of ham or Canadian bacon on each English Muffin. Top the ham with an egg square. Top each egg square with a cheese slice if you did not mix cheese into the baked eggs. Put top of each muffin on the egg sandwich. 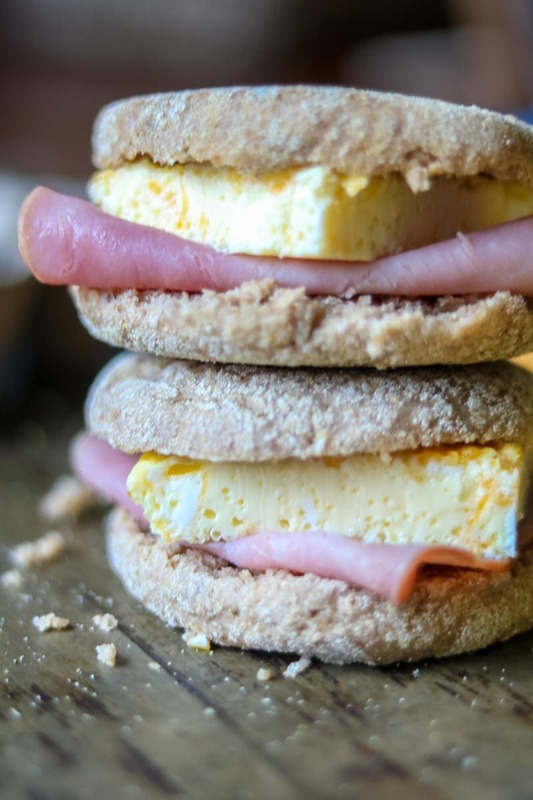 It is SMART to make as many a triple batch of these Healthy Copycat Egg McMuffins to keep on hand in your freezer. I choose to mix shredded cheese into my sheet pan eggs instead of topping each egg sandwich with a slice of cheese because it eliminates one step and it freezes better than a slice of cheese on an Egg McMuffin. I love to use thinly sliced deli ham on these homemade egg McMuffins, but Canadian bacon, cooked traditional bacon, or sausage patties are all great options for these classic breakfast sandwiches. Feel free to use any variety cheese you like. A classic Egg McMuffin has American cheese on it, but I like sharp cheddar or colby. I use whole wheat English muffins, but any variety English Muffin works. If I am serving these ham and egg sandwiches for a crowd, I toast up the English muffins in the oven while the eggs are cooking. To keep these breakfast sandwiches dairy-free, omit milk and cheese and use water in place of milk. To keep these McMuffin Sandwiches gluten-free, use gluten-free English Muffins. 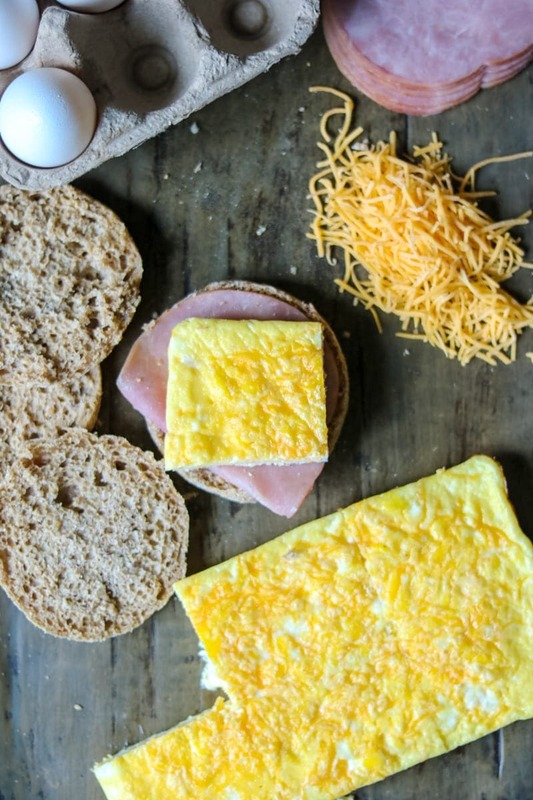 Ham and egg breakfast sandwiches come together easily with a sheet pan hack for cooking eggs. Make ahead and freeze for an easy, wholesome on-the-go breakfast and skip the drive-thru permanently. Whisk eggs, milk, salt, pepper and cheese together. Pour in silicone baking pan and bake for 12-14 minutes or until eggs are set. Cut eggs into 6 equal squares. Assemble sandwich by placing one egg square and one slice of ham on each English Muffin. Serve or cool and freeze for busy mornings. To keep these Egg McMuffin Sandwiches gluten-free, use gluten-free English Muffins. Instead of mixing the cheese into the eggs, you can top each egg McMuffin with a slice of cheddar or american cheese. Yes, freezable breakfasts are a great thing to have on hand! You bet Helene! I hope you try them! What a genius way to make sandwiches for a whole week. Saves so much time in the morning. Delicious! Thanks Sharon! Anything for letting me sleep a few minutes in the morning helps! This is so smart! And no more stopping by the fast food chains in the morning for a breakfast sandwich, brilliant! This looks like everyone’s ideal breakfast! Healthy AND delicious! Thansk Julia–it really does make breakfast a breeze! we love egg mcmuffins! i love the idea of making them at home. thanks! You bet April. Making Egg McMuffins at home just makes busy mornings SO SO much easier. This would be a great grab and go option Nan! I love toasted muffins as well. Toast the muffin and let cool and then layer the egg on. This will keep the muffin from getting soggy when frozen. This is a great idea for making a quick and easy breakfast at home! It makes busy mornings so much easier for sure! These are a great way to sneak a healthy but quick breakfast into the morning rush. No frying and a healthier brown muffin – it’s a great way to go. Exactly! I love this for a healthy start!